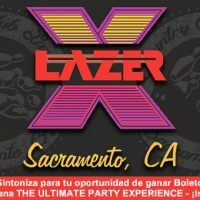 LAZER X AHORA CUENTA CON UNA ARENA REMODELADA DE 3000 PIES CUADRADOS, PRECIOS ESPECIALES PARA GRUPOS DE JÓVENES Y ESCUELAS. LAZER X ESTA ABIERTO DE 12 DEL MEDIA DÍA HASTA LAS 4 DE LA MANANA TODOS LOS DIAS AL IGUAL QUE ENCONTRARÁS ESPECIALES DIARIAMENTE. VISITA COUNTRYCLUBLANES.COM PARA MAS INFORMACIÓN. PENDIENTE ESCUCHANDO LA BUENA 92.1 FM PARA TU OPORTUNIDAD DE GANAR BOLETOS, O PARTICIPA PARA LA OPORTUNIDAD DE GANAR THE ULTIMATE PARTY EXPERIENCE SOLO LLENA LA FORMA DE ABAJO ↓ PARA MAS INFORMACIÓN LEE LAS REGLAS DESPUÉS DE LA FORMA DE REGISTRACIÓN. Gracias por participar. "Importante" Revisa y confirma en tu e-mail para no ser descalificado. A PARTIR DEL LUNES 4 DE FEBRERO 2019 Y CONTINUANDO HASTA EL MARTES 30 DE ABRIL 2019, RADIO ESCUCHAS DE LA BUENA 92.1 FM, MAYORES DE 18 AÑOS TENDRAN LA OPORTUNIDAD DE GANAR UN PAQUETE THE ULTIMATE PARTY EXPERIENCE PARA 10 PERSONAS EN COUNTRY CLUB LANES & LAZER X.
REGISTRATE Y CALIFICA: RADIO ESCUCHAS DE LA BUENA 92.1 FM, VISITEN LABUENA921.COM Y REGISTREN SU INFROMACION BAJO LA PESTAÑA CLUB VIP. RADIO ESCUCHAS DE LA BUENA 92.1 FM TAMBIEN PODRAN MANDAR UN POSTAL CON SU NOMBRE COMPLETO, DIRECCION, NUMERO DE TELEFONO, Y NOMBRE DEL CONCURSO O PUEDEN REGISTRARSE EN PERSONA EN LA ESTACION LOCALIZADO EN EL 1442 ETHAN WAY, SUITE 101, SACRAMENTO, CA 95825 ANTES DE LAS 5:00 PM EL DIA LUNES 29 DE ABRIL 2019. CONCURSO: UN GANADOR DE ENTRE TODAS LAS INSCRIPCIONES REGISTRADAS SE SORTEARÁ EL MARTES 30 DE ABRIL 2019 Y GANARÁN THE ULTIMATE PARTY EXPERIENCE PARA 10 PERSONAS EN COUNTRY CLUB LANES & LAZER X. EL VALOR ESTIMADO DEL PREMIO ES $350.00 PROPORCIONADOS POR COUNTRY CLUB LANES & LAZER X CON FINES PROMOCIONALES. EL GANADOR SERÁ NOTIFICADO POR TELÉFONO Y/O CORREO ELECTRÓNICO. REGLAS ADICIONALES: SOLO PUEDE CALIFICAR UNA VEZ. NO ES NECESARIO NINGUNA COMPRA U OBLIGACIÓN. EL PREMIO NO ES TRANSFERIBLE. EL GANADOR DEL PREMIO DEBE PROPORCIONAR UN IDENTIFICACION VÁLIDA DE LOS ESTADOS UNIDOS. LOTUS SACRAMENTO CORP. NO ES RESPONSABLE DE LA CANCELACIÓN DEL CONCURSO COMO RESULTADO DE EVENTOS NO DENTRO DEL CONTROL DE LOTUS SACRAMENTO. EL GANADOR ES RESPONSABLE DE TODAS LAS OTRAS CUOTAS QUE PUEDAN SURGIR DE LA ACEPTACIÓN DEL PREMIO, INCLUIDOS TODOS LOS IMPUESTOS APLICABLES, INCLUIDOS LOS IMPUESTOS FEDERALES. LOS PARTICIPANTES ACUERDAN INDEMNIZAR Y SOSTENER INADECUADO LOTUS SACRAMENTO CORP. TODOS LOS PATROCINADORES PARTICIPANTES, SUS RESPECTIVOS AFILIADOS, DIRECTORES, OFICIALES, AGENTES, PERSONAL, ADMINISTRADORES, ASIGNA DE CUALQUIER Y TODA RESPONSABILIDAD, PÉRDIDA, COSTO, DAÑO, LESIÓN O MUERTE, INCLUIDOS LOS ABOGADOS HONORARIOS DERIVADOS, RELACIONADOS O EN CONEXIÓN CON PARTICIPACIÓN EN LA PROMOCIÓN / CONCURSO Y / O ACEPTACIÓN DEL PREMIO. LOS EMPLEADOS, AQUELLOS DOMICILADOS CON, Y LAS FAMILIAS INMEDIATAS DE EMPLEADOS DE LOTUS SACRAMENTO CORP. Y LOS PATROCINADORES PARTICIPANTES SON INELIGIBLES. LOTUS SACRAMENTO Y LOS PATROCINADORES PARTICIPANTES SE RESERVAN EL DERECHO DE USAR NOMBRAMIENTOS, VOZ E IMAGEN DE LOS GANADORES CON FINES PROMOCIONALES. UNA COPIA COMPLETA DE ESTAS REGLAS ESTÁ DISPONIBLE EN LOTUS SACRAMENTO, 1442 ETHAN WAY, SUITE 101, SACRAMENTO, CALIFORNIA DURANTE HORAS DE OFICINA. BEGINNING MONDAY FEBRUARY 4, 2019 AND CONTINUING THROUGH TUESDAY, APRIL 30, 2019, LA BUENA 92.1 FM LISTENERS, 18 OR OLDER WILL HAVE THE OPPORTUNITY TO WIN ONE ULTIMATE PARTY EXPERIENCE FOR 10 PEOPLE AT COUNTRY CLUB LANES & LAZER X. REGISTER & QUALITY: LA BUENA 92.1 FM LISTENERS VISIT LA BUENA921.COM AND REGISTER YOUR INFORMATION UNDER THE CLUB VIP TAB. LA BUENA 92.1 FM LISTENERS MAY ALSO MAIL IN A POST CARD WITH THEIR NAME, ADDRESS, PHONE NUMBER, AND NAME OF CONTEST OR SIGN UP IN PERSON AT THE STATION, LOCATED AT 1442 ETHAN WAY, SUITE 101, SACRAMENTO, CA 95825 BY MONDAY, APRIL 29, 2018 BEFORE 5:00 PM. PRIZE DRAWING: ONE PRIZE WINNER FROM AMONG ALL REGISTERED ENTRIES WILL BE DRAWN AT RANDOM ON TUESDAY, APRIL 30, 2019 AND WILL WIN ONE ULTIMATE PARTY EXPERIENCE FOR 10 PEOPLE AT COUNTRY CLUB LANES & LAZER X. THE ESTIMATED VALUE OF THE PRIZE IS $350.00. PROVIDED BY COUNTRY CLUB LANES & LAZER X FOR PROMOTIONAL PURPOSES. WINNER WILL BE NOTIFIED BY PHONE AND/OR EMAIL. ADDITIONAL RULES: YOU MAY ONLY QUALIFY ONCE. NO PURCHASE OR OBLIGATION NECESSARY. PRIZE IS NON-TRANSFERRABLE. PRIZE WINNER MUST PROVIDE A VALID U.S. GOVERNMENT ISSUED PHOTO ID AND TAXPAYER IDENTIFICATION NUMBER. LOTUS SACRAMENTO CORP. IS NOT RESPONSIBLE FOR CANCELLATION OF THE CONTEST AS A RESULT OF EVENTS NOT WITHIN THE CONTROL OF LOTUS SACRAMENTO. WINNER IS RESPONSIBLE FOR ALL OTHER FEES WHICH MAY ARISE FROM ACCEPTANCE OF THE PRIZE INCLUDING ALL APPLICABLE TAXES INCLUDING FEDERAL INCOME TAXES. ENTRANTS AGREE TO INDEMNIFY AND HOLD HARMLESS LOTUS SACRAMENTO CORP. ALL PARTICIPATING SPONSORS, THEIR RESPECTIVE AFFILIATES, DIRECTORS, OFFICERS, AGENTS, STAFF, ADMINISTRATORS, ASSIGNS FROM ANY AND ALL LIABILITY, LOSS, COST, DAMAGE, INJURY, OR DEATH, INCLUDING ATTORNEYS’ FEES ARISING OUT OF, RELATING TO OR IN CONNECTION WITH PARTICIPATING IN THE PROMOTION/ CONTEST AND/OR ACCEPTING THE PRIZE. EMPLOYEES, THOSE DOMICILED WITH, AND THE IMMEDIATE FAMILIES OF EMPLOYEES OF LOTUS SACRAMENTO CORP. AND PARTICIPATING SPONSORS ARE INELIGIBLE. LOTUS SACRAMENTO AND PARTICIPATING SPONSORS RESERVE THE RIGHT TO USE WINNERS NAMES, VOICE AND IMAGE FOR PROMOTIONAL PURPOSES. A COMPLETE COPY OF THESE RULES ARE AVAILABLE AT LOTUS SACRAMENTO, 1442 ETHAN WAY, SUITE 101, SACRAMENTO, CALIFORNIA DURING NORMAL BUSINESS HOURS.